A hen apron or hen saddle is a piece of chicken apparel, worn for a temporary period of time, to prevent picking, rooster spur damage, aerial predator attacks, and for dress up! We are pleased to present our Hen Couture™ brand hen saddles! Our Hen Couture™ hen jackets are designed with both functionality and aesthetics in mind. 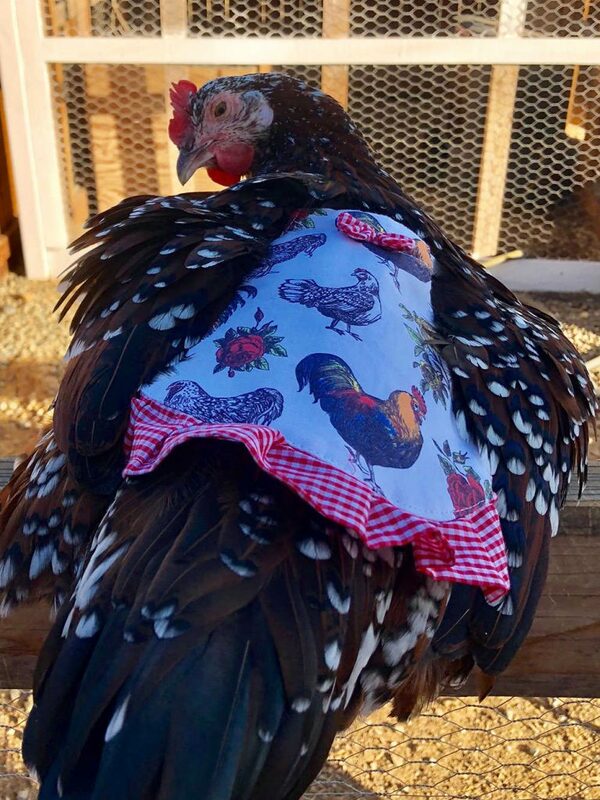 ChickenGuardian partnered up with Tara Grier of Fluffy Layers™, the creator of The Egg Collecting Apron®, to incorporate her beautiful farm girl inspired patterns so that your hens are protected and looking fabulous at the same time! There are two elastic bands that allow for the saddle to be secured around the base of the wings and provide ultimate comfort without impeding on your chicken’s normal movement and activities. The sides and length are perfect for standard size hens, providing coverage on the back down to the base of the tail feathers. The breathable fabric is high quality and machine washable. At the moment, there are three styles to choose from, and we are looking to come out with holiday themed saddles in the future so that your girls can dress for any occasion and always be on point! The cute bow at the top and lower ruffles match in color and pattern. You can find our Hen Couture™ hen saddles available for sale here.